Two days have come and gone since Nintendo first revealed Skyward Sword. By now most of us have gotten over our first impressions of the graphical presentation and the introduction demo Miyamoto presented during the show. Now we have to ask the lasting questions: how does Skyward Sword play? Are the controls a step forward for Zelda, or just another “waggle gimmick” that couldn’t have been done with a traditional button press? In lieu of our own hands-on accounts, we’ve taken the time to gather as much information as we can from all corners of the interwebs. First Question: Were the problems during the Miyamoto demo due to technical interference, or are they actual flaws in the gameplay? Forget the not-so-elegant swordplay show put on by Shigeru Miyamoto at Nintendo’s E3 press conference. We just got back from playing the new Legend of Zelda adventure, Skyward Sword, and found the new control system to be quite responsive,. As Shigeru Miyamoto demonstrated the newly-named Skyward Sword, some in the audience were concerned about what appeared to be technical issues. As the legendary developer tried to aim Link’s bow, the controls behaved erratically, causing him to shoot arrows into the ground. After playing through a section of the game, however, I can confirm that this truly must have been a fluke technical error during the conference – the controls are fantastic. IGN: Keep in mind that Nintendo had a pretty dreadful live demo at its press conference, so anyone watching might be concerned that the game might not work as advertised. Watching that demo first hand I can tell you exactly why Miyamoto was having a problem: Wii Motion Plus can use the infrared sensor bar to recalibrate itself, and with the audience filled with devices emitting infrared, it was throwing off the device something fierce. I had the same problem when trying to play Wii Sports Resort last year in our video studio: infrared pollution. Second Question: How does the swordplay work in this game? 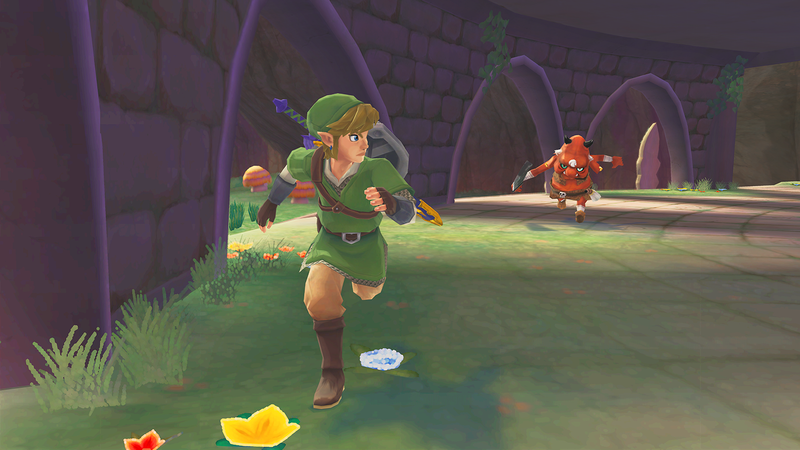 Gamespot: Link’s iconic weapon is mapped to respond more or less exactly to your remote motions. If you move your remote-wielding arm out to the right, so does Link. If you lift the remote straight above your head, Link will hoist the sword aloft. […] If you deliberately move your remote out to the side and then quickly slash to the other side, you’ll execute a horizontal swipe. If you move it up to the left and then swing back down to the right, you’ll do a diagonal slash. Once you get the hang of properly positioning the remote before your attacks, it’s easy to wield the sword the way you like. It is a more methodical system than the one employed by Twilight Princess, and the game has a neat little mechanic that helps reinforce the approach you need to take. Holding your sword in a position to strike for a few seconds will imbue the weapon with a charge. 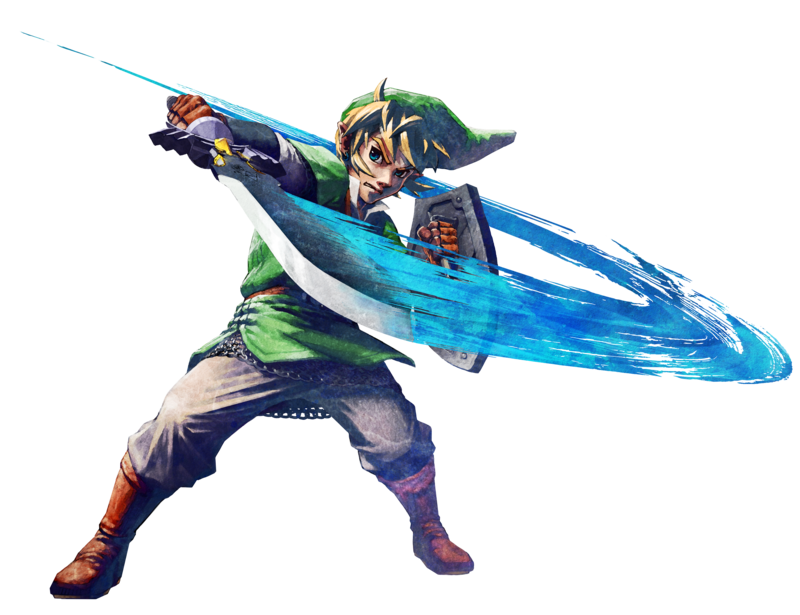 Charged attacks are more powerful, and Link delivers them with an enjoyable visual flourish. There’s also a goofy appeal to running around with your sword held aloft, menacing any and all enemies who cross your path. 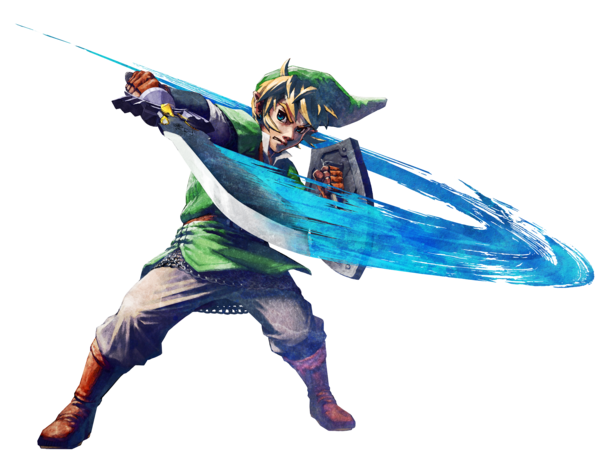 In addition to straightforward directional slashes, Link can execute horizontal and overhead spin slashes, performed by swinging both the remote and nunchuk together in the appropriate direction. You can also thrust with the remote to perform a jab attack. The shield responds to your nunchuk gestures as well. Lifting the nunchuk raises your shield, and flicking it delivers a shield bash that, if well timed, can daze enemies and set them up for the kill. 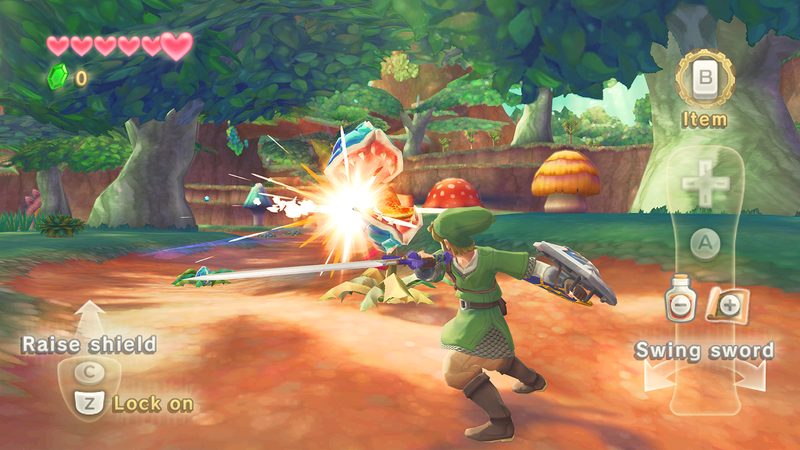 If he doesn’t daze enemies, Link will have to contend with their efforts to block his attacks. Pudgy porcine thugs use their clubs to block one direction, while large hulking skeleton warriors have two blades with which to deflect Link’s blows. Even fierce deku baba plants now have armored mouths and are only susceptible to being sliced across the mouth. Everything is tailored to getting the most out of the new sword controls. IGN: The Wii MotionPlus definitely helps with Link’s ability to slice and stab with 1:1 precision. It took a bit to get used to the “shield on nunchuk” control because you had to whip the nunchuk to bring it out, but tap a button to put it away – whipping the nunchuk while the shield’s out does a shove move that deflects projectiles back to their source. I particularly like the idea of looking at enemies to see how you’re supposed to attack them. The Deku Baba plant creatures opened their mouths vertically or horizontally indicating the only direction you could slash them to take them down. This bled into the demo’s boss battle where you’re attacking a giant scorpion with weak spots in each of his giant claws: the arachnid would open his pinchers a certain way, telling the player which way to attack. You can’t just twitch your hands around, but you don’t need to swing in giant arcs like Red Steel 2, either. If you select different items, you can get your sword back out just by swinging the controller. The sword-aiming and shield-timing combined in my 20-minute demo to give the impression that Skyward Sword’s combat is going to be deeper and more demanding than past Zeldas, where you mostly just hacked away at whatever enemy you currently had Z-targeted. 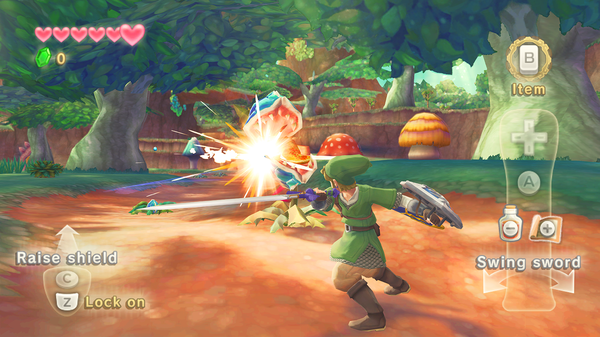 Sure, you can still take a bunch of hits and collect hearts to stay alive if you don’t want to explore the finer points of the combat model here, but if you do get a mastery of the more direct way you handle your sword and shield in this game, and combine that with Link’s traditional set of flips and dodges, you’ll be able to pull off some snazzy moves mid-fight and escape from a lot of battles unscathed. Third Question: What about the new items? Shooting a bow and arrow works a bit like Wii Sports Resort, but not entirely. After selecting the bow from the game’s helpful radial item-selection menu, you hold down the C button on the nunchuk to ready an arrow, pull back on the nunchuk and let go of the C button to fire. You don’t have to hold the Wii Remote in front of your face—you can keep it trained on the screen to aim with the pointer. The Wii Sports Resort archery mode has been brought to Zelda in his crossbow [sic]: to aim and fire you use the Wii remote’s pointer to target enemies, then flick the Nunchuk back to pull back the string. Letting go of the button lets the arrow fly. I have to admit, this wasn’t very intuitive in the thick of a fight. Shooting a slingshot is easier—just point and shoot. Another interesting implementation of motion involves bomb control. You’ll pull the explosive out with the B button, and can either throw it or roll it across the ground depending on the motion you use with the remote. Instead of slashing at one particular deku-bobba [sic], I baited him into lowering his mouth to the ground and finished him off by bowling a bomb directly into it. Throwing bombs is fun. As they showed in the live demo, you can toss explosives in front of you or roll them underhand. 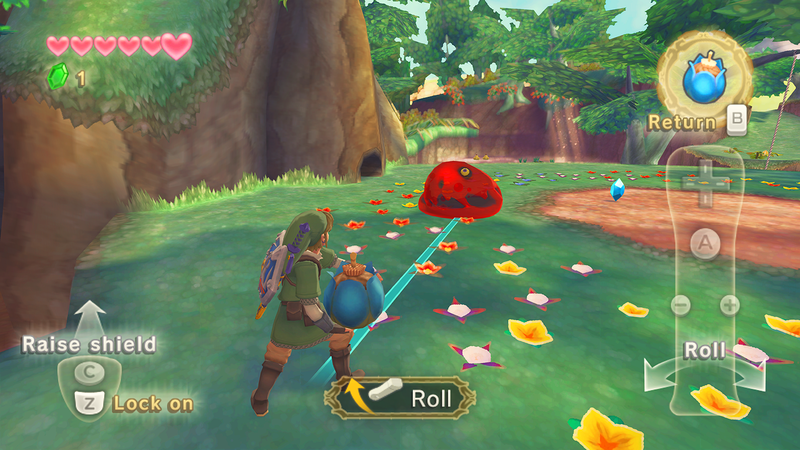 I rolled a bomb toward a suspicious pile of rocks and exploded them to reveal a hidden door. The new whip is particularly fun and allows you to grab items like hearts and rupees from a good distance away, tracking your remote gestures in the same way the remote does. Another new addition is the beetle, a tiny flying gizmo that Link can launch from his wrist and steer using the remote. The beetle can pick up items and return them to Link or use its skills for more aggressive maneuvers. 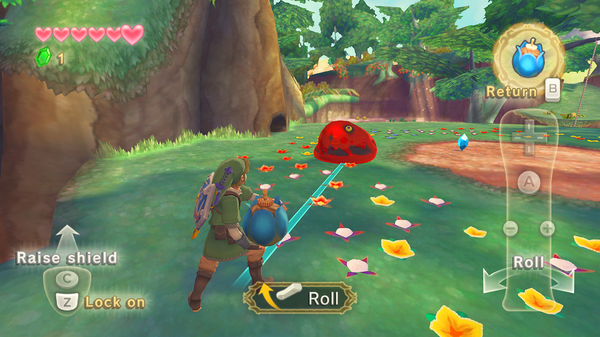 By sweeping down to a bomb flower, the beetle can grab a bomb and then fly over enemies, switching the player’s point of view to better enable aerial bombardment. The beetle is thrown and then remote-controlled by moving the remote around, and the controls are spot-on. You can use it to collect items, annoy enemies, explore areas, and more. Fourth Question: What about that HUD? One big change to the series’ history is the item management system. Ever since the original NES Zelda, switching weapons always required the gamer to pause. Skyward Sword makes this process far more convenient and intuitive, as holding in the B button will bring up an item wheel without pausing the action. At one point, I encountered a swarm of bats while my bombs were equipped. As they flew at me, I ran away, held the B button to bring up the wheel (while still running), rotated the wheel with MotionPlus control, and let go to select my whip. The action doesn’t stop at any point, but it’s still easy to move around and select your new item while avoiding danger. For those asking (a lot of you! ), Nintendo has said that giant Wii remote overlay on the screen is an instructional aid for the E3 demo and that the final game’s UI is still in development. I’d expect it to be gone in the final version. Last Question: Summary of the game overall? Nintendo definitely has work ahead of them. But the company made it clear: it’s coming next year. Plenty of time to tweak it. While it still remains to be seen if the new control system will make this Legend of Zelda stand out from the rest, we were left with a positive initial impression. After we spent a few minutes getting the hang of the timing, Skyward Sword‘s one-to-one sword motion was more satisfying and more engaging than flailing ever was, and that bodes well for the adventure to come. Twilight Princess was a very good Zelda game, but it left Wii owners wanting more out of their console. Considering that it was essentially a Gamecube port, the game wasn’t designed around the Wii’s capabilities. With Skyward Sword, we finally have a built-from-the-ground-up Zelda experience that takes full advantage of the system and its underused MotionPlus accessory. Since Skyward Sword won’t be available until 2011, we’ll have to survive on this brief demo for now. It’s impossible to tell what the game’s long adventure will feel like, but after all the years of hype, it’s good to see Zelda making progress. The Legend of Zelda: Skyward Sword is not the radical reinvention of the Zelda franchise Nintendo has implied it might be. But it is everything you wanted out of Twilight Princess when it came out alongside the Wii four years ago. 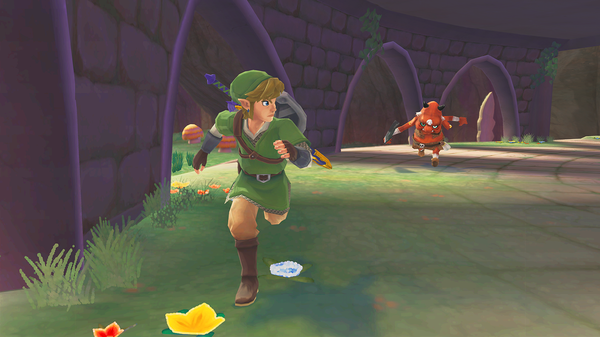 Remember how you thought the Wii’s motion controls would enhance Zelda‘s combat when you first looked at them? Precise one-to-one sword movement, smooth and accurate aiming, the visceral impact of moving the remote and nunchuk as if you were fighting with a sword and shield… all that stuff is in here, and I thought it felt great to play.